Having moved beyond the spark of inspiration, the architect sets to work. Pen and paper, compass and ruler are applied to sculpting out the shape of his dreams. He makes discoveries along the way, makes critical decisions, and watches as he progresses along the path to creation. This is what the Two of Wands of the Minor Arcana implies. Know what this Rider Waite tarot card means in both the upright and inverted positions. 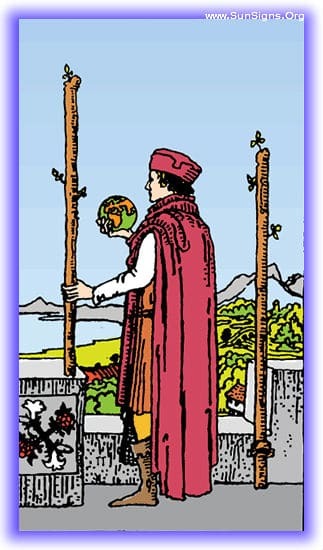 The plan envisioned in the Ace of Wands is maturing. You’re expanding your boundaries and are being driven forward by the need to bring your vision into reality. The decisions are being made to stick with known paths, or taking a chance and going large. Just remember, big returns require big investments! You’ve spent the past working on sketching out the details of a plan, you’ve laid the foundations and have done good work. All the decisions have been made, and it’s time to put them into action! Beginnings are times for caution, but they are also powerful times. You are creating the cradle for your brainchild, the place where it will grow and bring your dreams to fruition. Knowing that this is a critical time, take care! The time is not yet ripe for you to begin planning for that dream of yours. But that time is coming, for now let it rest and wait for the explosion of inspiration that will keep you up nights, sketching, planning, plotting. This is an excellent position to start from, if this Minor Arcana tarot card has appeared, it’s letting you know that the answer is Yes, but you’re at the beginning of that Yes. Everything else is up to you from here on out. 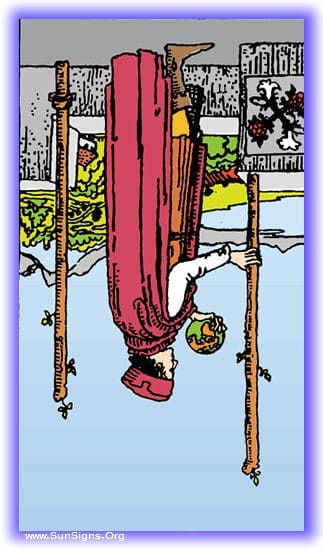 The two of wands reversed indicates a need for organization, and a need to start over. Often partway through a plan we’ll find that we’ve been wandering all over the place, and we need to bring ourselves back into focus to make sense of our creative ramblings. Pull back and start over is the lesson being imparted here. Ahhhh! Too much stuff! The past has seen you rambling and writing and scribbling, but there’s been no solid direction. This is an indicator that your past efforts may have been productive, but not effective. It’s time to focus. Chaos reigns. Your current creative energies are all over the place, and like a poorly insulated heating vent, you’re losing as much as you’re actually getting effective use out of. Take a moment to step back, take a breath, and pick one project to work with. Your momentum is building, and there’s a warning on the wind for you. If you don’t bind down and focus your energies now, you’ll be pulled in a million different directions by the time you hit full speed. Set your course, pick a project, and keep yourself on task. The answer is clearly no. Things are in a time of chaos and unsettlement, so whatever you are asking is equally chaotic. It may be able to be flipped into a state of yes, simply due to the inherently unstable nature of its current circumstances.